A greyhound may have a low thyroid level according to the T4 test but that is not an indicator of whether or not thyroid supplement is necessary. Many greyhounds will go through life with a thyroid level below normal but will never need supplementation. 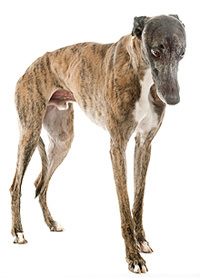 The fact that your greyhound may be in the normal range but shows traits of low-esteem or other clinical signs, like those listed above, may mean that your greyhound would respond favorably to thyroid supplementation. The clinical signs are the primary factors in determining if your dog should be treated, as opposed to test results. Our most significant concern is how your greyhound feels about himself and his general esteem level going through life. If you have adopted your greyhound from NGAP and we have predetermined that it is appropriate for that specific dog to be treated with thyroid supplement, we will send you home with the inital dose for free. The true test comes when your dog goes into its new home and you can observe how it reacts to that new environment. Some dogs may not be pre-evaluated to need thyroid supplementation but once they are away from their 'pack' or their previous environment, that determination may change. Adopters should contact our office if they see their greyhound displaying any of the clinical signs listed above. We generally will give a greyhound Soloxine, which is the brand name, as opposed to the generic. In our view, the brand works better than the generic. If your greyhound has been prescribed Soloxine, we suggest waiting one month before you return to your veterinarian to evaluate the changes in the T4 level due to the supplementation. You should make note of any positive or negative changes in your dogs behavior that occurred during that period. Greyhounds on thyroid supplementation appear to be at their best when their T4 level reads between 3.5-4.5. When having your greyhound's T4 level retested, it is important that the blood be drawn five hours after the pill is administered. If the timing is not correct the results will be skewed and will not be reliable. On very rare occasions, thyroid supplementation can make your greyhound hyperthyroid. If your greyhound becomes hyperthyroid he may become more easily agitated or potentially aggressive. If you see this happening, immediately reduce the greyhound's Soloxine dose to half of what you have been giving and if the symptoms persist, take your gryehound off Soloxine altogether. Be sure to talk to your veterinarian if this occurs. This situation is extremely rare. What these greyhounds HAVE had is good quality of life. They are better companions for their adopters and have enjoyed life to the fullest, as opposed to being frightened from everyday things that they encounter. Unfortunately, some vets have not spoken with greyhound adopters that are using thyroid supplement and are not hearing how well it works. Based on our observations, we have found that a low dose of thyroid supplementation will not significantly alter your greyhounds behavior. At NGAP, we only carry Soloxine 0.6mg, 0.7mg, and 0.8mg. 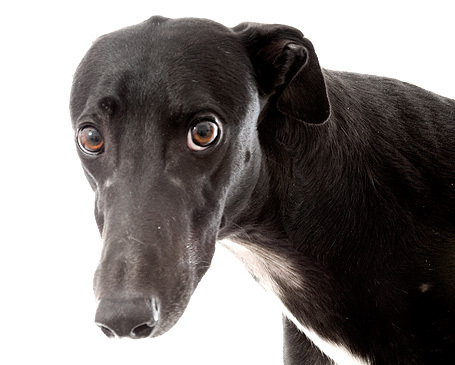 Depending on the dogs’ weight, female greyhounds are given Soloxine 0.6, twice a day, while the males are given Soloxine 0.7mg or 0.8mg, twice a day. If positive behavior changes are seen, but not quite satisfying, it is appropriate to do another T4 test. The T4 test should be done annually, regardless. It is this writer’s view that greyhounds testing between 3.5-4.5 while on thyroid supplement will function much better than greyhounds testing at lower levels. If the test does not bring the greyhound into that range and the greyhound is still symptomatic, we suggest raising the dose by 1/2 pill once a day and then, if necessary, twice a day and observing the results. Some vets will see a greyhound with a low T4 test and will prescribe a 0.3 twice a day dose. If your dog happens to also have esteem issues, this dose will probably do nothing to improve those issues. Keep in mind, we never want to make a dog hyperthyroid. If a better result is achieved with the higher dosage, we will maintain that dosage, but will another T4 test one month after to see if the greyhound is in the 3.5 - 4.5 range. For some dogs, thyroid supplement can be life-changing. We have seen cases where spooks have literally become normal dogs. Dogs that refuse to cross tile floors before dosing will cross that floor while on supplementation. The dogs appear to have greater confidence and are happier while on supplementation. A recent email from an adopter and dog trainer reads, “I tried taking him (his greyhound) off and also giving him less (Soloxine). It does not work. He gets shy and scared again.” This particular adopter has two dogs from NGAP, one that is on thyroid supplement and one that is not. We want all of our greyhounds to have good quality of life. Good quality of life means that they feel good about themselves and are not afraid of the world. We are not professing that greyhounds with the clinical signs listed above are hypothyroid. We are saying that greyhounds with these clinical signs do well when given thyroid supplementation. Almost every medication has an off-label use. When Rimadyl was first introduced to the market about ten years ago, it was the #1 NSAID medication probably in the world. It was directed specifically for use in arthritic conditions. Not long after its introduction, NGAP, being ahead of the curve as always, began using Rimadyl pre-op and post-op to modify pain. We spoke to Pfizer, the manufacturer of Rimadyl, about that use. At the time, they said that it was not on the label so they could not recommend it. The results we saw were great, so we continued to use it. Rimadyl is now widely used for pain modification in a wide variety of applications having nothing to do with arthrtitis. Our use of thyroid supplement is a similar comparison. Thyroid supplement works for some clinical signs that we see in greyhounds and makes them better. We are sorry it is not on the label, but it seems to work most of the time! 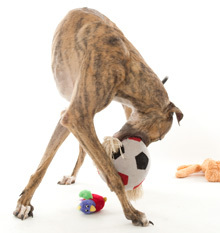 To help other greyhounds, please give us your feedback about your dog on thyroid supplement. My name is Dawn Markee. I adopted my grey, Diamond, from NGAP in May 2009. When we first brought Diamond to our home, she was nervous and shy, understandably so, being in a new environment. It seemed as though she was adjusting fairly well until little by little she no longer wanted to go outside for walks, we had to force her to go out of the house, she stayed in rooms by herself. By July of 2009, she began having 'accidents', sometimes more than once a day. If someone came in the house, she would urinate on the floor. She did not want to be anywhere near people other than those who live in our house, sometimes not even us and was fearful of other animals. She would be nervous all the time with her tail between her legs, to the point of having the shakes. It was very sad to see my hound in such a state. At this point, I called NGAP and was given both Soloxine and Amitriptyline. After being on the medication for a couple of weeks, Diamond improved greatly. She began going outdoors again and the indoor accidents disappeared completely. She started playing with toys and learned how to go up and down stairs. I attribute this improvement in her behavior to the medicine. In December 2009, Diamond had a visit to the vet at NGAP for her annual physical and vaccinations. The vet suggested that we try Diamond without the medicine. Within a week Diamond had returned back to the way she was acting in June and July. I called NGAP and got her back on the Soloxine .9mg twice a day and Amitriptyline 50mg twice a day. Once back on the medicine, Diamond returned to her happy place. She no longer has accidents in the house, she truly enjoys her walks outside. Diamond even acts like a puppy when she sees other dogs, she goes into play mode. If she is unable to greet other animals when she sees them, she cries to get their attention or mine to take her closer. Now, when Diamond hears me come home, she runs down the steps to greet me when I come in. She loves to play with her toys and she loves to do tricks for treats. After being back on the medicine, Diamond is like a new hound. She seems truly happy and I attribute this to the Soloxine and Amitriptyline. 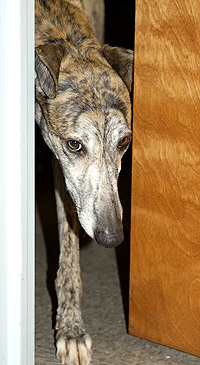 I am positive that without the medications that NGAP suggested for Diamond, she would be a very sad, unhappy greyhound. Diamond is a wonderful addition to our house and is a greyt addition to our family. I can't imagine life without her. She is such a good girl and I will continue to do what I have to do to see that she has a happy retirement in her forever home. Thank you for your help with Danger. I was not sure if I should send an update of Danger's progress now or after we begin the Soloxine.7 twice a day. I figured it would not hurt to send you the progress now and I will just touch base and update you again in another 4-6 weeks once Danger has been on the increased Soloxine for a bit. In early March, I called NGAP to discuss whether it would be appropriate to put Danger on Soloxine due to some symptoms he was showing. Danger was lethargic, showed only slight interest in toys (would pick them up sometimes and just carry them back to his bed), NEVER showed any interest in interacting with our other dog, no running or playing outside. He would just go outside, do his business and come back inside. Danger has always been very social with people and does not show any anxiety/nervousness with anyone. We decided to try putting Danger on Soloxine .6 twice a day. Slight improvement with Danger seemed to appear within 1-2 weeks. He began running in the yard, chasing and interacting with our other dog, and showing more interest in toys. Early May we had Dangers bloodwork redone and his results came back at 1.3 He still seems to be showing drastic improvement. He now will throw toys around the room and pounce on them, chase them if we throw them (he used to just stare at them), chase Grayce our other dog, run up and down the yard with the neighbor's dog, and gets EXTREMELY excited when I come home from work each day. He honestly acts like a completely different dog. I know some of it could just be due to him still adjusting to a new environment but I do believe a majority of it is a direct correlation to having him on this medication because it really did start to take effect pretty quickly after we started it. We will start him on the Soloxine .7 and let you know how he does. I can't emphasize enough how much we love this dog and are so happy to have him as a part of our lives. He is absolutely a perfect fit and we can't thank NGAP enough for picking him out for us.